It´s been 27 years! 27 years since I last attended a 220 Volt concert, then as part of a Swedish ”Monsters of Rock” package featuring the cream of Swedish hard rock and featuring the main contenders for the crown that Europe wore. The package included Treat, Electric Boys and of course 220 Volt, the band from the Northern county of Jämtland and its "capital" Östersund. I was 15 years old and this touring package came to my tiny hometown of Hofors in the summer of 1988. I was completely blown away by both Treat and 220 Volt that hot summer night and left with memories that will never fade, the biggest impression being made by 220 Volt. I was hooked! The sheer energy when they hit the stage to ”Firefall” blended with that unique feeling for writing a big hook! Guitarists Peter Olander and Mats Karlsson traded solos like I had never heard before and on top of that – the great and very personal voice of Joakim Lundholm. Back to 2015, March 27th to be exact. Eagerly I enter my car to drive the 70 kilometers from my home to Borlänge, a mid-sized Swedish town of about 50,000 inhabitants situated in the middle of Sweden. It is here that 220 Volt has decided to start their support of their brilliant new album Walking in Starlight (reviewed here: Electric Messengers Want Us To Walk In Starlight). It´s a different band I will be seeing tonight. 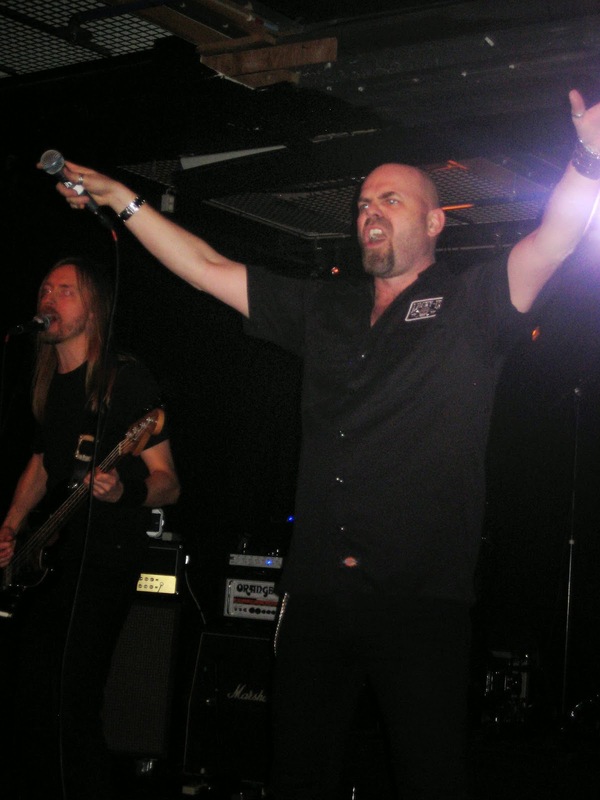 Joakim Lundholm is long gone and the vocals are now handled by Anders Engberg (Sorcerer, ex-Lion´s Share) who I have previously seen when Lion´s Share opened up for Saxon on their Unleash The Beast tour in 1997. A great frontman indeed to pick up where Lundholm left off to join Kraftztoff. God knows who will be handling the bass duties tonight, filling in for Mike Larsson who is no longer with the band. My guesses are either of the session musicians on Walking in Starlight, Johan Niemann (Evergrey) or Lars Ericson. I guess Johan would be busy with Evergrey so Lars Ericson then? All my guesses will turn out to be wrong but more on that later. Olander has also been replaced by the returning Thomas Drevin (guitarist on the first two albums). My expectations are high and as they should be when you go and see a band of this quality. I arrived a little after 10pm. It was announced that the first band would go on stage at 10pm, but that was not the case. It takes a long while before the first band, Thalamus, enter the stage so I spend some time at the merch stand when I see 220 Volt guitarist Mats Karlsson sorting out the T-shirts together with his wife. I stroll over to the merch area to talk to him. He promises a set of 60% old material and 40% new. They have been told three different times for their setlist so he does not know for how long they can play. He promises to try and play 10 songs at least. I only speak briefly to him and he signs my CD´s but I leave quite quickly not to disturb him in his work. Drummer Peter ”Hermie” Hermansson also appears at the merchandise stand but not long enough for me to catch him to sign my records. By then I had found a very comfortable couch to sit on. Too bad I don´t approach him because he is the only one to not show up after the show either. 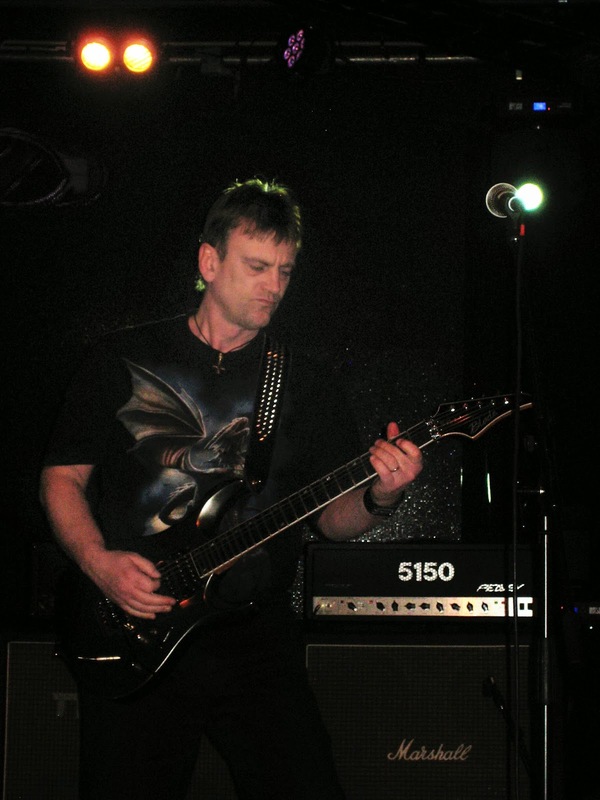 Thalamus entered the stage – a band I never have heard of before. They play a doomy kind of hard rock (think first two Black Sabbath albums). They sound good and have a lead vocalist/guitarist with an impressive voice although the early part of their set is hampered by technical issues. Some of the songs are too slow and bluesy for my taste, but they play a couple of great sounding tunes as well. Thalamus play a pretty short set (40 minutes?) and then it is time for me to leave the comfortable sofa I found in the back of the pub/dancefloor turned concert hall. Hermansson appears behind the drumkit and Karlsson/Engberg set up the mike stands as I enter the ”dancefloor” and move towards the stage. Now it's not far away! 220 Volt hits the stage and starts out with ”System Overload” from the new album. The band seems a little uncomfortable at the start but soon find their way in ”The Harder They Come” from their ”big” Max Norman produced Eye to Eye album (1988). ”It´s back to the 80´s” as Engberg says and they plow through ”I´m On Fire” which is another gem from Eye to Eye. 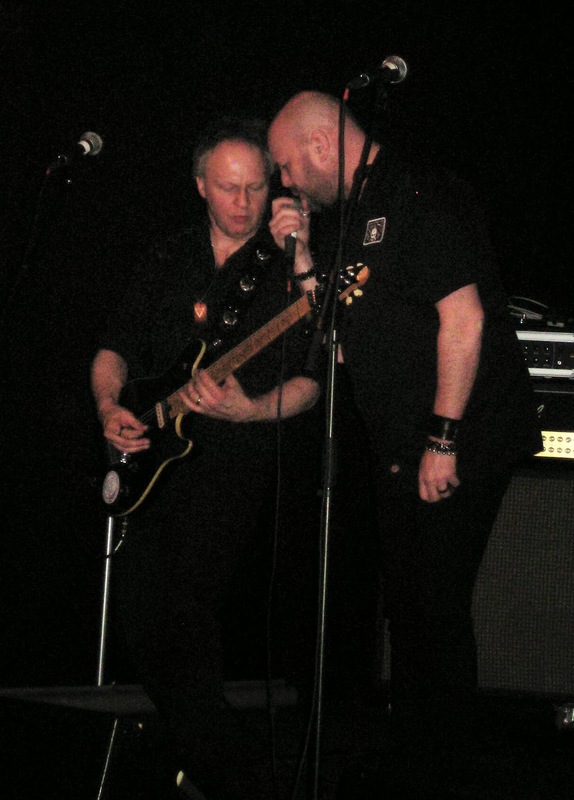 Anders Engberg introduces the band and on bass we have newcomer Fredrik Hallberg who also provides backing vocals. The people in the front seem to be as excited as I am by now and knowing every word of the songs from Eye to Eye I find myself singing along to the entire songs. Engberg seems a bit uneasy at times having to glance at the monitor to find the right lyric, but this is also the first gig in a long time. After the start with songs from Eye to Eye and Walking in Starlight the band announces that they are going to take us on a journey from the start (well nearly) to today and the new record. They start off with ”Woman in White”, the album closer from the very first self-titled album released in 1983, which also has Mats Karlsson singing the part of the verses. The song sounded great and very true to the original, but is sort of an odd pick in my book. It is followed by another old gem called ”Lonely Nights” - opener from the very same debut album. It is then time for my favourite performance of the evening. The intro to ”Walking in Starlight” starts with a distinct noise from Drevin's guitar. The band then jumps into the song and it gives me chills through my spine. This rocks like hell! An epic and melodic song of the highest standard possible. When it's finished Engberg talks a bit about the band existing for a long time – long before he joined and introduces the ”biggest song 220 Volt have written”. It´s time for the ballad of the evening and ”Love Is All You Need” which is of course, the big single off Eye to Eye that gained heavy rotation on MTV in the late 1980´s. On this song, I think the band hesitates a little and they seem a bit uneasy including lead vocalist Engberg. Still he invites the crowd to sing along to the chorus line and we all do what we can. The concert then ends with the band back on top and in an ecstatic way when they close with regular concert opener ”Firefall” The band is virtually on fire and it only leaves me wanting some more. I want ”Beat Of A Heart” and ”Power Games” but there is no time left and the Wolf is waiting in the wings. Hallberg is providing some bass grooves and backing vocals. I move back to my sofa in the back sorting out my thoughts when Anders Engberg grabs a beer and places himself in front of me. Time for a chat with him and some signatures on the CDs! I tell him about my experience with Lion´s Share and he signs my CD with them saying ”This was not yesterday”. Anders seems like a nice guy and he tells me they are not actually doing a tour because they all have got 9-5 jobs now and can only do this on weekends. They will play Uppsala tomorrow with Wolf again and then play the odd weekend gig before the festival seasons starts. Then they will play the Peace and Love festival here in Sweden and will return to my area in September for a gig in Gävle. I tell him I will be there and congratulate him on a great gig. Anders is not satisfied and says it could have been better. I leave him to his beer and now Wolf is on stage. They belt out their traditional heavy metal and they sound good. I find it a bit hard to digest the rough vocals that are not my cup of tea, but they have some loyal fans in the front singing along to their songs. I decide to buy a T-shirt so I go to the merchandise stand again. After watching Wolf for a while Thomas Drevin appears and I need him to sign my CD. We exchange a few words before I start talking to Mats Karlsson more in depth this time. Mats tells me of the troubles of getting their old classic albums out to the public again on CD. The band has been trying to buy back the rights but to no avail. Nobody is still with Sony/CBS Records Sweden from back when they were released and 220 Volt was on the label. As Mats puts it – they don´t know what they got and the archives are a bit of a mess. According to Mats they are not willing to license the albums to another record company either. That´s a pity because the younger fans will have a harder time (or not at all) to discover the treasure trove that is the back catalog of 220 Volt. When he asked the company what they are going to do with the recordings they told him they will digitize it. The albums are now finally available on I-tunes and other digital media. When I asked Mats about a possible physical release his response was ”It will not happen!”. Mats also revealed that there are unreleased songs that could be used as bonus tracks on possible future re-releases, but the band has some degree of control over it. Sony cannot issue them without the band's approval. Mats also said he was not sure of the quality of the songs, but that opinion could change from person to person. I think you are right Mats! I´ve bought records where one of the bonus tracks was the best song on the entire album. It´s a matter of taste I guess. If you read my review on the new Dalton disc called Pitstop for Decibel Geek (Dalton - Pitstop Review) you have this being the case. Mats also said he was not 100% happy with the gig (just like Anders Engberg) and told me this was the first gig since they reformed two years ago. They need some time and gigs to become tighter. I told him it sounded good from my point of view. Mats told me they would play a longer set tomorrow in Uppsala when only Wolf and them played. I told him I missed ”Beat Of a Heart” and he told me they would play that and ”Power Games” tomorrow. The people going to Katalin, Uppsala Sweden are in for a treat. Maybe it was also a bit surprising that the Mind Over Muscle album was left untouched. Just before we went separate ways Mats told me they are back for good and will continue this time. That was great news to me and I went back to watching Wolf again. I especially want to thank Mats Karlsson for a really nice chat (hard to hear everything with Wolf blasting through the speakers). I would love to do a further in-depth interview on the band sometime in the future. The concert hall was not even half full during the whole evening and I think Borlänge was unaware of what great bands were playing in their town this night. Wolf is a well respected heavy metal band, 220 Volt has near a legendary status in Sweden and Thalamus turns out to be a decent band as well. Time to wake up Borlänge and realize what you missed out on! I was only briefly familiar with Wolf and had never heard Thalamus before so I will not grade their performances. I think 220 Volt met my expectation although you could see this was the first gig where the band at certain points hesitated a bit. This will get better with more gigs under their belt. Being a fan of the new album I think the set was well balanced between new and old songs – maybe a couple of old songs got deleted due to short gig time this evening. I´ve already mentioned two of the songs. The biggest let down was the low crowd turnout – this being payday and everything. Maybe too many people being comfortable at home watching TV? I would rate the 220 Volt gig to 8 out of 10 geeks. Curfew is closing in when Wolf announce they have two songs left so I decided to leave with the clock approaching 2 a.m. I left Borlänge with a great feeling, a T-shirt and signatures from everybody performing on the album except ”Hermie” Hermansson and I will be back in September for sure when they play in Gävle. BUY Walking in Starlight here!